China Water Affairs Group Limited ("China Water Affairs" or the "Group") is listed on the Hong Kong Stock Exchange (stock code: 0855). 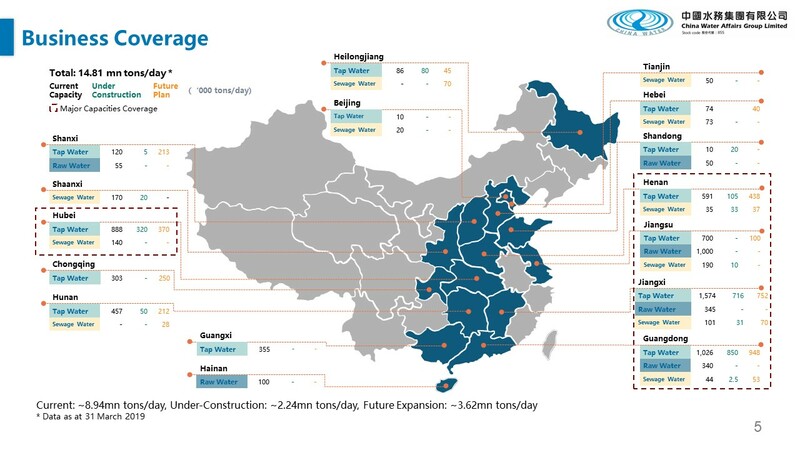 By investing, building and operating water affairs projects in China, the Group has rapidly built its reputation as one of the largest integrated water affairs operators providing raw water, tap water, sewage treatment and related value-added services. To date, the Group's businesses in mainland China span over 50 cities. Integrated water treatment capacity of the Group exceeds 8 million cubic meters per day. Most senior management of China Water Affairs are seasoned water industry experts with extensive first hand experience and expertise in developing and operating water projects in China water industry. China Water Affairs is actively expanding its business coverage in the water services market in China with a view to establish a comprehensive industrial chain covering water resources, water supply systems, sewage treatment and water supply infrastructure construction. The Group has already formulated different strategies to expand its business throughout China by mergers and acquisitions. Many municipal governments have granted the Group exclusive franchises for 30 years, which is set to bring the Group a significantly higher investment return in the future.